Who... Can Take UEN Technology Classes? People in Utah who are associated with education can take classes from the Utah Education Network. It is helpful if you are currently teaching but is not required. All classes are technology-related and focus on integrating technology in the classroom. Classes are available online, in-person, MOOC or as a Flex Course. MOOC courses are open entry and open exit and can be completed at your own pace. A Flex Course is one day in-person and the remainder of the course is completed online (within 30 days). All classes include education-specific components: tips for managing student projects, ideas for incorporating technologies into curriculum instruction, technology to enhance student learning and motivation. They relate technology use to teaching and learning theories such as SAMR, Bloom’s Taxonomy, Multiple Intelligences, Inquiry-Learning, etc. Classes are based on the ISTE Standards for Educators. Many are suitable for technology novices. All in-person classes include a mix of follow-along demonstration and practice and non-computer activities for reinforcement and application of the skills. Participants will work alone, in small groups, as a class and we provide variation in activities in other ways as well. All online classes include weekly assignment submission and asynchronous discussion. Most require reading or viewing of video tutorials to obtain content/skills knowledge. Some include live web conferencing, online quizzes, web research and other activities. All classes are free. If you choose to complete Southern Utah University credit, there is a per credit recording fee directly to SUU after completing all the requirements. General Professional Development courses are $21 per credit and Endorsement courses are $23 per credit. 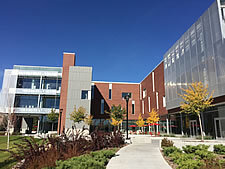 Most in-person classes are held at the Sorenson Arts and Education Complex - SAEC at the University of Utah. (see map) Our offices are in SAEC 1240. Some courses are also available at district offices or schools. The course catalog will indicate each location. Online classes do not require an in-person meeting and may be accessed from any location with a fast Internet connection. We provide classes by request at schools, districts and conferences throughout the state of Utah. In-person classes at our Univ. of Utah facility run from 8:30 a.m. – 4:00 p.m. with 30 minutes for lunch. Usually classes are scheduled Tuesday - Thursday and Saturday. There can be variations to this schedule and participants should check the course catalog for exact dates and times. Most online classes run for 6 weeks. A few courses including the Endorsement Courses run for 12 weeks. We hold two, 6-week sessions of online classes in the Fall and Spring, and one in the Summer. When… Are Updated Schedules Posted? We repeat most of our courses throughout the year. New catalogs are posted on August 1 (Sept – Dec), December 1 (Jan – May) and April 1 (June – Aug). Why... Should I Take a Class? Obtain an Educational Technology Endorsement. Earn relicensing points or lane change credit. Improve your understanding of technology for educational use. Develop hardware, software, multimedia, internet and teaching skills. Refresh your classroom practice with new ideas and fun activities. Click the link for the course catalog and select a course that looks interesting to you. The UEN Technology Courses can be filtered on the left. Choose a section on dates that you are available, and begin the registration process. To complete registration, you’ll need to enter a UEN Canvas Login. How... Do I Manage My Courses? Go to the UEN Course Catalog, login with your UEN Canvas Login and navigate to the Student Dashboard. You can confirm and cancel courses, as well as view the history of courses for which you are registered. How... Do I Request a Course? Contact the UEN Professional Development manager or call 801-587-1717.